The Truth : The above posting is a re-circulated rumour that is introduced once again in the internet and multiple messaging platforms by irresponsible parties with ulterior motives. We would like to reinstate once again that this news is FAKE!. It was never true, be it back in 2011 or now. This news was a part of a series of rumours that were fabricated to urge Malaysians to boycott Gardenia that were fueled based on the emotional uncertainties felt based a large pocket of the nation. We urge all netizens to stop, think and do the rightful. Do not be manipulated and puppeted into supporting parties with their own hidden agenda. We would really appreciate it if you would forward this to the person that sent this message to you. However, please refer to the following links for more details or do feel free to contact our toll free line at 1-800-88-3228 and speak to our customer service officers for more information on the matter. 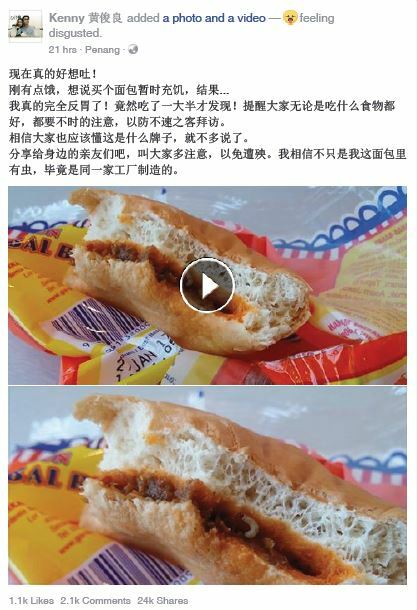 Since late yesterday, we noticed a string of postings mushrooming across all social media platforms allegedly claiming to have found alive worm in their Sambal Bilis Bun. The shocking thing was, all these complaints were accompanied with what is believed to be an identical photograph <https://www.facebook.com/photo.php?fbid=10206992598088453&set=pcb.10206992617848947&type=3&theater> (Archive) used as an instrument in a previous posting by a Facebooker < www.facebook.com/kennyozl>. We are convinced that this is an orchestrated and concerted effort by an irresponsible third party with their own conniving agenda. With this, we would like to urge all netizens to take the time and evaluate the situation/ facts for themselves. Please do not get manipulated into participating in the under handed tactics deployed by this irresponsible party. We had proceeded to investigate this matter based on the video and photos that was posted even though we have not been contacted thus far and found it to be baseless and untrue, simply due to the nature of the baking process. The worm would have been dead when exposed to the extreme baking heat of 240 degree Celsius for approximately 12 minutes which makes it impossible for the worm to survive not to mention to be actively crawling about. Having said so, we suspect that this posting was fuelled by ill intentions and we would like to urge all the netizen out there to correct the wrong and circulate our official statement. Also, please feel free to contact our friendly customer care consultants for further information/ clarification on the matter at 1-800-88-3228. In the light of the recent claims that bleached wheat flour is harmful to the health, we would like to take this opportunity to assure our loyal consumers that Gardenia products are not affected in any way. Gardenia KL would like to stress that Gardenia only uses high protein unbleached wheat flour to produce all our products. We would also like to take this opportunity to re-instate that all Gardenia Sandwich loaves have no Artificial, Synthetic or Unnatural Preservatives. We would appreciate it if you could forward this statement to your friends that may be interested. If you have any further enquiries, please feel free to contact our Customer Care Officers at our toll-free line 1-800-88-3228. The Truth: The above posting has been circulated on the internet recently. However, please be informed that Gardenia KL and the Gardenia found in Sabah, Sarawak and Brunei are separate business entities with their own operating systems and procedures. Gardenia KL only has the license to manufacture and distribute its products in Peninsular Malaysia. We would like to take this opportunity to reinstate that Gardenia KL takes our responsibility very seriously to ensure our consumers can enjoy fresh, hygienic and healthy products daily. We would really appreciate it if you would forward this to the person that sent this message to you. However, please do feel free to contact our toll free line at 1-800-88-3228 and speak to our customers service officers for more information on the matter. It was brought to our attention that Gardenia Food Industries [Gardenia Sabah] operations have been allegedly shut down by the relevant authorities in Sabah. We at Gardenia Bakeries (KL) Sdn Bhd [GBKL] would like to pre-emptively clarify that GBKL and Gardenia Sabah are two completely different companies, and they are not related. GBKL operates only in Peninsular Malaysia and supplies to this market only. Gardenia Sabah covers that market specifically. The two companies have totally different management, different policies and different operational systems. GBKL would like to assure all our loyal consumers in Peninsular Malaysia that it has always been our policy and belief to give the best of our ability in terms of products and services. We would also like to take this opportunity, to invite the public to come and see our operations with your own eyes. For any further information/ reservations, please contact us at 1-800-88-3228 or email to customer_service@gardenia.com.my. Hey, can I get sponsor from gardenia for my college’s event?? For further details on sponsorship request, please contact Ms. Azrina from our Marketing Department at 03-5542 3228. Adakah kita akan mendapat harga murah sekiranya beli roti terus dr kilang? Untuk belian terus dari kilang, harga borong akan diberikan dengan pembelian kuantiti minima yang telah ditetapkan oleh syarikat. Untuk maklumat lanjut dan tempahan, sila hubungi Puan Mala dari Bahagian Jualan di talian 03-5161 3228. Terima kasih. Thank you for giving us the opportunity to clarify in regards of the prices of Gardenia products. We would like to take this opportunity to explain to the customer that the overall cost of the Gardenia products consists of not only distribution cost, but a large portion of our production cost is made up of raw material, operating, labour, utility and other related costs. With this, the impact of the dip in petrol prices in January 2015 is incomparable to the increased in raw material costs due to the increase incurred in foreign exchange, salary increases, the rising cost of utilities (as the rate remains as per previous increase) and so on. Therefore, it saddens us to inform that we are forced to maintain the price of our products at this time. For any further information, please contact us at 1-800-88-3228 or email to customer_service@gardenia.com.my. In the light of the recent news about the botulism contamination of milk from New Zealand, we would like to assure our consumers that Gardenia products are not affected in any way. Gardenia wishes to confirm that the milk used in all our products are originated from Europe (France, Germany & Belgium). Gardenia Bakeries (KL) Sdn. Bhd. Im interested to buy 288 loafs of original classic (400g) before end of the month to distribute to a masjid near my house. How much and do you charge for delivery to Sri Sentosa Jln Klang Lama? To place an order or for any further assistance, please contact Ms.Mala from our Sales Department at 03-5161 3228. I would like to purchase 1500 pieces of your fluffy bun for my wedding on November.how much will it cost??? Pertaining the above matter, to place an order or for any further assistance, please contact Ms.Mala from our Sales Department at 03-5161 3228. HI . I would like to collaborate with your company on some events. Are you the best person to speak with for the next year marketing plan? Thank you for your interest in our company. For further enquiries please contact the Marketing Department at 03-5542 3228. Thank you. Nak tanya jawatan feeder driver tu ada kosong lagi tak? Terima kasih kerana berminat dengan syarikat kami. Untuk keterangan lanjut tentang jawatan, sila hubungi Bahagian Sumber Manusia di talian 03-5542 3228. Hi, I sent an email regarding bulk order of your product but I get no reply. Let me know the price for 400 pcs of twiggies & 400 pcs of quick bites & 400 pcs of squiggles. Thank you for your interest in our products. Firstly, I would like to apologise for the delayed response. If you would still require the quotation, do email me directly at balkis@gardenia.com.my. Thank you and have a nice day. Hai,klau saya nak tempah secara berperingkat dlm 600 bgkus roti gardenia delicia pd pringkat pertama then 200 lebih untuk peringkat ke2,jumlah 800 lebih..brapa ya harga untuk 1 bungkus?boleh hantar ke kolej tun syed nasir jalan temerloh titiwangsa tak? Terima kasih kerana berminat dengan produk kami. Untuk tempahan dan keterangan lajut, sila hubungi Puan Mala dari Bahagian Pemasaran di nombor 03-5161 3228. Selamat petang…nak buat pertanyaan pasal tempahan product Gardenia.Kalau penghantaran ke Sibu,Sarawak ada tak? ?Ingat kalau ada saya nak buat tempahan untuk roti gardenia delicia 200 bungkus untuk 3 kali seminggu..(600 bungkus satu minggu). Untuk makluman, Gardenia Bakeries (KL) Sdn Bhd hanya mempunyai lesen pengeluaran dan pengedaran untuk Semenanjung Malaysia sahaja. Saya Intan Hayati, merupakan penuntut di UiTM Shah Alam, saya diberi tugasan untuk memohon derma bagi tujuan sumbangan kepada kampung angkat Unit Kokurikulum UiTM Shah Alam di Kemboja. Bagaimanakah caranya untuk saya memohon derma daripada pihak Gardenia? Salam Intan Hayati. Terima kasih kerana berminat dengan syarikat kami. Untuk keterangan lanjut tentang permohonan derma atau sumbangan, sila hubungi Bahagian Pemasaran di talian 03-5542 3228. May I have layout of factory of gardenia? It is for my Operation Management assignment. Could you forward this message to respective person? Your help is such a great help for me. Thanks. For further inquiries please contact our Human Resource Department at 03-5542 3228. I’m currently doing economic assignment, may I have some of your economical/accounting information ? Thank you for your interest in our company. For queries and information, please contact our Human Resources Department at 03-5542 3228. Terima kasih kerana berminat dengan produk syarikat kami. Untuk makluman, syarikat kami tidak menyediakan atau mempunyai kursus pembuatan roti. hi, can i get sponsor from gardenia for my college’s event?? For sponsorship application please email to azrina@gardenia.com.my. salam , sy nak tanya kalau nak buat tempahan roti gardenia utk koperasi sekolah di kelantan macam mane ek ? Terima kasih kerana berminat dengan produk syarikat kami. Untuk keterangan lanjut dan tempahan, sila hubungi Puan Mala di talian 03-5161 3228.
saya merupakanpelajar politeknik merlimau, saya perlukan bantu pihak Gardenia. Kalau tidak keberatan saya perlukan carta organisasi syarikat Gardenia Malaysia. Salam Saiful Khairi. Terima kasih kerana berminat dengan syarikat kami. Untuk maklumat yang tuan perlukan, sila hubungi bahagian Sumber Manusia syarikat kami di talian 03-5542 3228.
assalamualaikum… mcm mna klu nak membeli roti gardenia dalam kuantiti yg banyak?? terima kasih.. saya siti, d setiawangsa..
Terima kasih kerana berminat dengan produk kami. Untuk keterangan lanjut dan tempahan, sila hubungi Puan Mala di talian 03-5161 3228. Untuk keterangan lanjut tentang jawatan, sila hubungi Bahagian Sumber Manusia syarikat kami di talian 03-5542 3228. Terima kasih. Untuk keterangan lanjut dan tempahan, sila hubungi Puan Mala di talian 03-5161 3228. Terima kasih. Untuk nombor telefon bagi mendapatkan bekalan roti sila hubungi Cik Fara di talian 03-5161 3228. Where can I buy gardenia breakthru in Putrajaya? For your information, Gardenia Breakthru had long been discontinued. I would like to suggest you try our Gardenia 100% Wholegrain with Canadian Purple Wheat Bread, which has low GI Index and high in anti-oxidant. Thank you. Saya nak beli roti gardenia cream yg harga rm0.70 tu sebanyak 140. Dimana saya boleh beli sebab di kedai2 selalunya x banyak. Saya tinggal di kuala kangsar perak. Saya nak guna roti tu hari jumaat ni 21/2/2014. Harap pihak tuan dapat membantu. Terima kasih. Untuk tempahan dan keterangan lanjut, sila hubungi Puan Mala di talian 03-5161 3228. Terima kasih. Nak tnye, kalau sy nk order twiggies 300 bungkus, brapa harganye? Harga borong bagi Gardenia Twiggies ialah RM1.25 satu pek. Untuk tempahan dan keterangan lanjut, sila hubung Puan Mala di talian 03-5161 3228. Kalau saya nak order choc chip muffin 300 bungkus berapa harganya. Harga borong Gardenia Chocolate Chips Muffin ialah RM1.40 satu pek. Jumlah harga untuk 300 pek Gardenia Chocolate Chips Muffin ialah RM420.00. Untuk keterangan lanjut dan tempahan, sila hubungi Puan Mala di talian 03-5161 3228. Terima kasih diatas info yg diberikan…. Utk twiggies 150 pek berapa pula harganya..
Harga borong Gardenia Twiggies ialah RM1.25 satu pek. Boleh saya tahu cara untuk memohon tajaan gardenia untuk program siswa@kampung? Untuk keterangan lanjut tentang prosedur permohonan tajaan, sila hubungi Bahagian Pemasaran di talian 03-5542 3228. Untuk permohonan penajaan, sila tujukan kepada “Bahagian Pemasaran” dan emel kan ke alamat yang tersebut. salam..,Saya izzati pelajar universiti malaya.Saya ditugaskan untuk mencari sumbangan untuk projek kami ke Indonesia,,Boleh saya tahu cara untuk memohon sumbangan daripada pihak Gardenia? Untuk keterangan tentang prosedur permohonan sumbangan, sila hubungi Bahagian Pemasaran di talian 03-5542 3228. Terima kasih. I’m Nadiah. May I know to whom should I refer to if I want to request for your twiggies wagon. We are having an event and it would be lovely if Gardenia Bakeries (KL) Sdn. Bhd. can dispensed free twiggies to these school’s children. Thank you. For inquiries about the Twiggies Wagon, please contact the Marketing Department at 03-5542 3228. Sy nak tanye ade x kerja kosong sebagai kerani store..
Untuk pertanyaan tentang kerja kosong, sila hubungi Bahagian Sumber Manusia syarikat kami di talian 03-5542 3228. Salam Abdul Rahman, bagi memasarkan produk kami di koperasi tuan, sila hubungi Puan Fara dari Bahagian Jualan di talian 03-5161 3228. Terima kasih. Untuk permohonan sumbangan sila hantar permohonan dan maklumat tentang program yang akan diadakan ke Bahagian Pemasaran di nombor faks 03-5542 3213. Sila hubungi Bahagian Pemasaran di talian 03-5542 3228 untuk keterangan lanjut. Terima kasih. Nak tanya harge produk ne. Mungkin nak buat tempahan yg banyak. Untuk keterangan harga bagi belian pukal, sila hubungi Puan Mala di talian 03-5161 3228. Hai sy nk tanya kalau nk buat tempahan roti garinia bun perisa coklat’jagung’vanilla utk 400 bungkus brapa ye harga borong?? Untuk keterangan lanjut tentang harga dan tempahan, sila hubungi Puan Mala dari Bahagian Jualan di talian 03-5161 3228. Terima kasih. Terima kasih kerana berminat dengan produk kami. Untuk makluman, syarikat kami tidak berniaga atau membuat penghantaran ke Sarawakwalau untuk tujuan apa sekali pun. 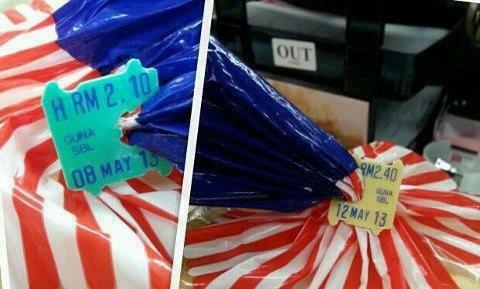 sy mencari roti reject/expire dengan kuantiti yg bnyak adakah gardenia ada menjualnya..
Untuk makluman, syarikat kami tidak menjual roti yang ‘reject’ atau ‘expire kepada umum. Untuk makluman, harga pukal bagi Gardenia Twiggies ialah RM1.25 satu pek dan Gardenia Quick Bites Chocolate Chips Muffin ialah RM1.40 satu pek. Untuk keterangan lanjut dan tempahan, sila hubungi Puan Mala dari Bahagian Jualan di talian 03-5161 3228. Harga borong untuk Gardenia Chocolate Chips Muffin ialah RM1.40 satu pek. Untuk keterangan lanjut dan tempahan, sila hubungi Puan Mala di talian 03-51613228. Dimana saya boleh dapatkan roti gardenia respberi susu dan krenberi. Saya dah cari merata kedai tapi susah nak jumpe. Roti Gardenia Raspberi Susu Dan Kranberi ada dijual di pasaraya-pasaraya. Diharap tuan dapat berhubung secara terus dengan Jabatan Pemasaran di talian nombor 03-5542 3228 untuk kami memberi maklumat yang lebih lanjut. Dear Gardenia….just wondering saw one of your blog here stating that u guys dun have the license in Sabah nor Sarawak..my uncle has a small shop who wish to sell there in Kuching. Can I buy here and send it there by post. Please advise. Thanks. As had been stated, we do not have the license to market our product in Sabah, Sarawak and the Borneo, hence we are not able to sell any product there. Hi. Saya ingin membeli quick bites choc chip muffin sebanyak 1000 pieces. Berapa total hrga pukal utk produk ini?tq..
Harga pukal Quick Bites Chocolate Chips Muffin ialah RM1.40 satu pek (mengandungi 2 biji muffin). Untuk keterangan lanjut dan tempahan, sila hubungi Puan Mala dari Bahagian Jualan kami di talian 03-5161 3228. Bolehkah sekiranya saya ingin memohon sedikit sumbangan bg meyambung pelajaran dari pihak gardenia? Untuk makluman, penajaan syarikat adalah dalam bentuk produk keluaran syarikat kami sahaja. hai.saya nabihah daribatu pahat johor,saya berminat nak beli roti gardenia utk majlis perkahwinan saya pada 16/9.berapa harga borong gardenia twiggies dan gardenia choc chip muffin?minimum kuantii borong berapa ye?bolehkah pihak gardenia menghantar terus pesanan saya ke rumah? Terima kasih kerana berminat dengan produk kami. Untuk keterangan dan maklumat lanjut tentang belian secara pukal, sila hubungi Puan Mala dari Bahagian Jualan kami di talian 03-5161 3228.
hi, can i get sponsor from gardenia for my faculty’s event?? For any request of sponsorship, please send your request, with details of the programmes attached, to the Marketing Department. Berapakah harga kalau saya ingin membeli roti gardenia krim coklat dan vanila sebanyak 121 bungkus di melaka? Untuk keterangan tentang harga borong dan tempahan, sila hubungi Puan Mala dari Bahagian Jualan di talian 03-5161 3228. Terima kasih. Hi, may I know who can I get in touch with the logistic dept of your company? Thanks. For details and further enquiries, please contact our office number at 03-5542 3228. Terima kasih kerana berminat dengan produk syarikat kami. Untuk keterangan lanjut tentang harga dan belian secara pukal, sila hubungi Puan Mala dari Bahagian Jualan syarikat kami di talian 03-5161 3228. So what’s the price now? The price of our 400g Original Classic is RM2.40 for the past few years. What will be the price in the next 3 months? I hope you maintain the price so I can enjoy my breakfasts. Thank you for taking your time to comment on our weblog. Firstly, we would like to apologize for the delayed response. Nevertheless, as you can see, we have not increased our prices and do not have plans to do so at this point of time. Thank you for your support. Im want to order muffin for 500 ,can give the price for one?? Thank you for your interest in our products. Firstly, I would like to apologize for the delayed response. If you would still require the quotation, do email me directly at balkis@gardenia.com.my. Thank you and have a nice day. sebab saya sangat memerlukannya untuk menyiapkan assignment saya. saya berharap encik dapat memberikan kerjasama. Terima kasih atas minat Cik terhadap organisasi kami. Berhubung permintaan diatas, Cik bolehlah menghubungi Jabatan Sumber Manusia kami ditalian 03-5542 3228. I am interested to order bulk quantities of all your products on a daily basis to be sold at Kuching, Sarawak. It may be up to 1000 pcs per product per day for testing the market here for my first order. For second order onwards definitely would be more. This is because I realised the huge market demand that East Malaysia has for your products. So if opening an outlet here is not possible I am very interested to get your products here on a daily basis. We appreciate your interest in Gardenia’s products. Please be informed that Gardenia Bakeries (KL) Sdn. Bhd. only has the right for manufacturing and distributing our products in the Peninsula Malaysia. If you have any further queries, please feel free to contact Ms. Lavinia Anthony or me the undersigned at 03-5542 3228.
salam 1 Malaysia, sy nak mengadu , sy menunggu jawapan utk carta organisasi , 2 kawan sy dah hntr email , maaf utk berkata .. kami menunggu . dan terus menunggu, last2 terpaksa mncari inisiatif lain . maaf sekali lagi .. harap di perbaiki . Berhubung perkara tersebut, sila hubungi Jabatan Sumber Manusia di talian 03-5542 3228. Thank you for your interest in our products. Delicia Butterscotch are sold in retail and chain-stores as well as supermarkets. Our delivery days to the outlets are Monday, Thursday and Saturday. For further enquiries please contact our Marketing Department at 03-5542 3228. I would to order 700 pieces of twiggies for my wedding. How much it cost? Ms. Mala at 03-5161 3228.
selamat sejahtera, saya seorang siswi yang sedang menjalankan satu assignment tentang syarikat tuan, (gardenia). Masalah saya sekarang adalah kekurangan maklumat mengenai harga pasaran bagi produk tuan dan saya amat memerlukannya untuk menyiapkan assignment saya. harap pihak tuan boleh memberi kerjasama dengan mengirimkan maklum balas di email saya. Untuk maklumat dan keterangan lanjut, sila hubungi Bahagian Sumber Manusia syarikat kami di talian 03-5542 3228.
hi. Can i get a sponsor from gardenia for my college events? do i need to call or email. if i make call, which number do you prefer? thankyou. For application of sponsorship, please contact the Marketing Department at 03-5542 3228. Thank you. 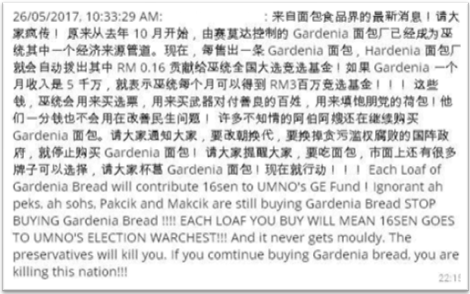 Following the recent general elections, certain irresponsible parties / netizens have taken to spreading more lies about Gardenia on Facebook and Internet. This time, they are saying that the price of Gardenia bread in Peninsular Malaysia has increased. They even have a photo of the ‘kwik lok’ tag showing the prices (refer above). THIS IS A BLATANT LIE. The ‘kwik lok’ is from a different Gardenia product, sliced Sandwich Bun (Burger bun). This Facebook message is being spread by unscrupulous parties who may have a benefactor that is not able to compete honestly in an open market. There has been no increase in the retail price of Gardenia bread in Peninsular Malaysia. We would very much appreciate if you could share the truth with your family and friends.